Hide and Seek by Jane Casey. A Jess Tennant Mystery. Review: Do you like engrossing, intriguing, mystery books? 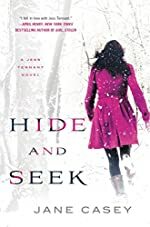 If you do, Hide and Seek by Jane Casey is the right book for you. In this novel, Jess Tennant, a regular high school girl, is faced with a humongous problem when one day, one of her classmates that she was supposed to meet at her town's library fails to show up. She tries her best to find her missing classmate, hurdling over obstacles like family, love life, and maybe even the law. Will she ever be able to solve this peculiar case? Jess Tennant has always been sticking her nose into other people's lives. It's a curious habit she's always had. But one day, at a Christmas party in Port Sentinel, one of the girls that is in her history class, Gilly Poynter, harms herself at the party after another group of girls gang up on her. Later after that event, Gilly is paired with Jess for a project. They plan to meet at the library. The only thing is, Gilly never shows up. Jess starts to fuss about it, but police officer Dan Henderson, which coincidentally is also the father of her boyfriend, Will, says not to worry about it. But things start turning bad. Gilly never returns, and the whole town is searching for her. Jess desperately tries to find her dodging all kinds of complications along the way. Hide and Seek is perfect for middle school readers. There are mature references and vocabulary, so I would not suggest younger ages read this story. Mystery lovers will adore this novel. The character's personalities are all unique, making the book even more enticing. The way Jane Casey wove the events in a cliffhanging way every chapter adds spectacular aspects. The sensational final conclusion of the book will leave readers in shock, in either a good or bad way, you can decide if you are determined to read it. We would like to thank St. Martin's Griffin for providing a copy of Hide and Seek for this review. Have you read Hide and Seek? How would you rate it?